PodiuMax Pop up Golf Chipping Net helps your golfing, be the next Jack Nicklaus or Rory McIlroy PodiuMax Portable Golf Chipping Net is designed for all level golf players, perfect for indoor/outdoor use. It comes with a 1.2 feet neat bag for easy carrying and storage, so you can take it to anywhere you want and practice anytime. Also, it’s awesome to set up a game with different target pockets with your families, friends or colleagues, making your practice more interesting than just hitting shots. Be the next winner to wear the Green Jacket, all you need is PodiuMax Golf Net. Just do not hesitate to order it! 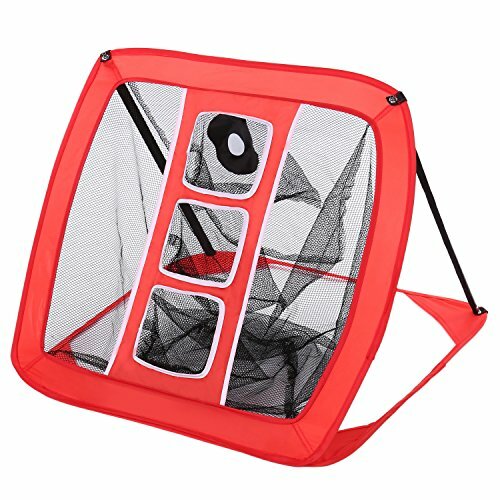 Package Content: 1*Golf Chipping Net 1*Carrying Bag 2* Fiberglass rods Warning: PLEASE BE CAREFUL WHEN YOU UNZIP IT FROM THE CARRYING BAG SINCE IT WILL LITERALLY POP UP. KEEP OUT OF REACH OF CHILDREN. 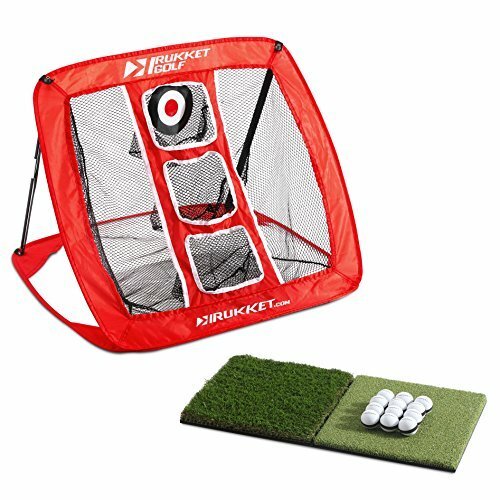 Rukket Golf Practice Chipping TargetRukket's Golf pop-up golf game can help improve your golf chipping game indoors and out.Use at home, the office, or your TAILGATE!Have fun and practice your chipping game at home, in the office, at a tailgate or anywhere. 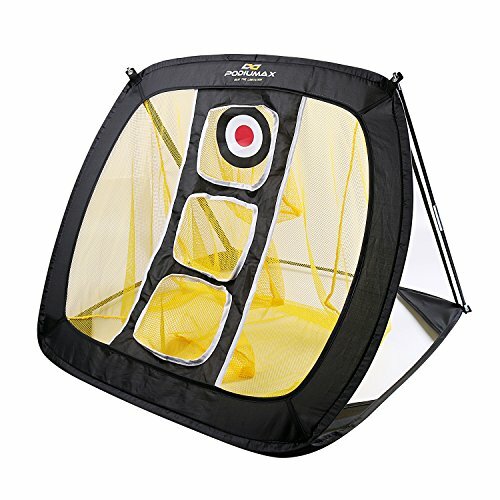 The pop-up feature and nylon bag with carrying straps allows for easy set up and makes this golf training aid exceptionally portable.Practice Season after Season and beyond...Made from durable nylon netting with a spring steel frame that will let you enjoy this for years to come. Great gift for golfing husband, dad, mom, kid or teen that keeps on giving!Any inquires please reach out to our US customer service reps directly and we will be happy to help! Also, please check out our other golf nets to practice every club in your golf bag! 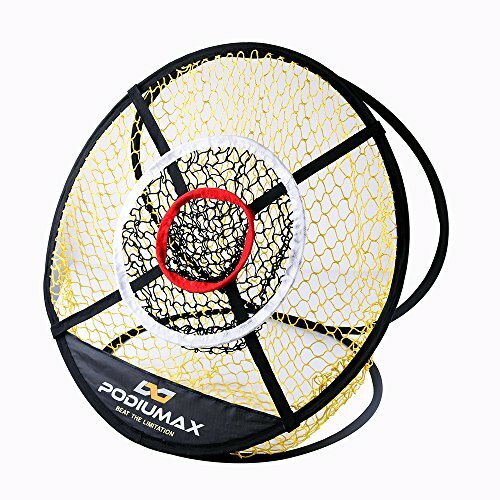 PodiuMax Pop up Golf Chipping Net helps your golfing, be the next Jack Nicklaus or Rory McIlroy PodiuMax Portable Golf Chipping Net is designed for all level golf players, perfect for indoor/outdoor use. It comes with a 1.2 feet neat bag for easy carrying and storage, so you can take it to anywhere you want and practice anytime. Also, it’s awesome to set up game with different target pockets with your families, friends or colleagues, making your practice more interesting than just hitting shots. Be the next winner to wear the Green Jacket, all you need is PodiuMax Golf Net. Just do not hesitate to order it! Package Content: 1*Golf Chipping Net 1*Carrying Bag 2*Ground Stakes Warning: PLEASE BE CAREFUL WHEN YOU UNZIP IT FROM THE CARRYING BAG SINCE IT WILL LITERALLY POP UP. KEEP OUT OF REACH OF CHILDREN. Black Friday Sale: Take 15% off until 11/25/18. (Limited Time Only)| Perfect your short game! 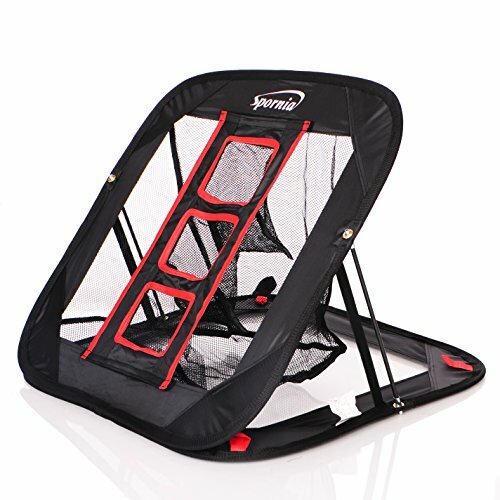 Practice your chip shots anywhere with the Spornia Pop-up Golf Chipping Net. Sharpen your skills by aiming inside the three skill targets or simply detach the targets to chip in a bigger target/farther range. Great training aid gift for a golfing husband, dad, mom, kid or teen. 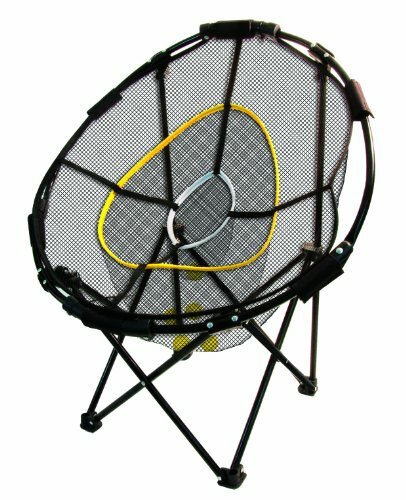 Constructed to withstand outdoor conditions (Includes 4 stakes for each corner) Made from durable nylon netting with a spring steel frame. Fully expanded size: 25-inches in diameter. Folds down to 11 inches in diameter. To see video demos, visit our YouTube Page and search for "SPORNIA "
The Chipster was designed by Go Sports to provide a compact and versatile training aid that will help improve your shipping and shave stokes off your round. Our unique target system allows you to focus on a specific landing area for both lob shots or lower chip and run shots. The Chipster can be setup and put away in seconds making it a must have training tool for golfers of all abilities. Whether you or a friend is looking to improve their golf game, the Chipster is a great place to start! The Chipster is backed by a full lifetime warranty and our Go Sports customer service team based in sunny Southern California is available M-F (we golf on the weekends) to help with any issues. Pack it up, grab your clubs and get chippin’! Get everything you need to practice your chips with the Callaway Golf Chip-Shot Chipping Net! This training aid features three primary targets running vertically on the front, allowing you to work on chips and pitches from a range of distances and trajectories. Its ultra light weight and easy portability features allows you to quickly pack it up and take it wherever you’re going without any hassle. Forget about the complex and confusing chipping nets that take forever to set up! The Callaway Chip Shot Golf Net takes seconds to set up with its “pop-up” feature and tearing it down is just as easy once you’re finished, as it easily collapses to a 10.5 diameter. It’s the perfect training aid for wedge practice! Plus! Practice those shots outside or indoors! Use foam balls for indoor or office practice. Are you ready to smoke your friends out on the golf course? 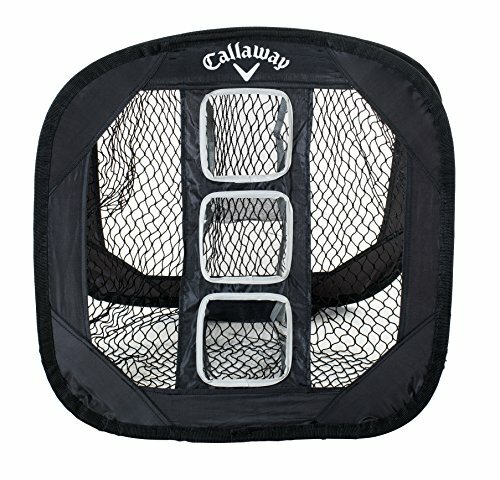 The Callaway Golf Chip-Shot Chipping Net is the next step to doing just that! 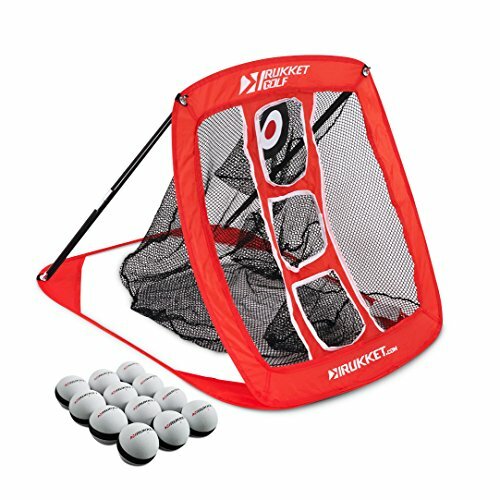 Looking for more Pop Up Chipping Net similar ideas? Try to explore these searches: Diamonds & Rubies Rose Perfume, Apple Service Manuals, and Spinning Ring. Look at latest related video about Pop Up Chipping Net. Shopwizion.com is the smartest way for online shopping: compare prices of leading online shops for best deals around the web. 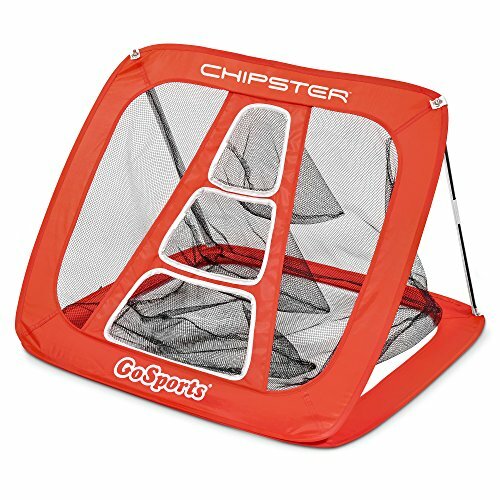 Don't miss TOP Pop Up Chipping Net deals, updated daily.